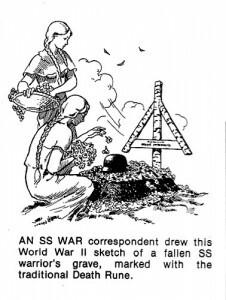 Printed on the inside cover of each NATIONAL VANGUARD is the statement: The symbol which appears in the NATIONAL VANGUARD logotype is the Life Rune. It comes from an ancient alphabet, or futhark, used in northern Europe for many centuries before the general adoption of the Roman alphabet there. The Life Rune signifies life, creation, birth, rebirth, and renewal. It expresses in a single symbol the raison d’etre of the National Alliance. 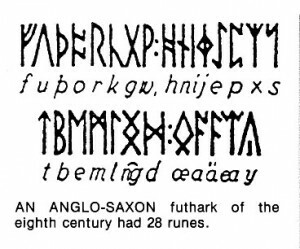 Later — something between 2,000 and 1,800 years ago — the Germanic peoples began using a script having 24 characters, with both phonetic and magical-symbolic values, called runes. These were organized in a system known as the “futhark.” The name “futhark” derives from the initial sounds of the names of the first six runes, that is: feo – ur – thurs – asa – rit – kaan. This is similar to the way in which the word “alphabet” comes from the names of the first two Greek letters, alpha and beta. 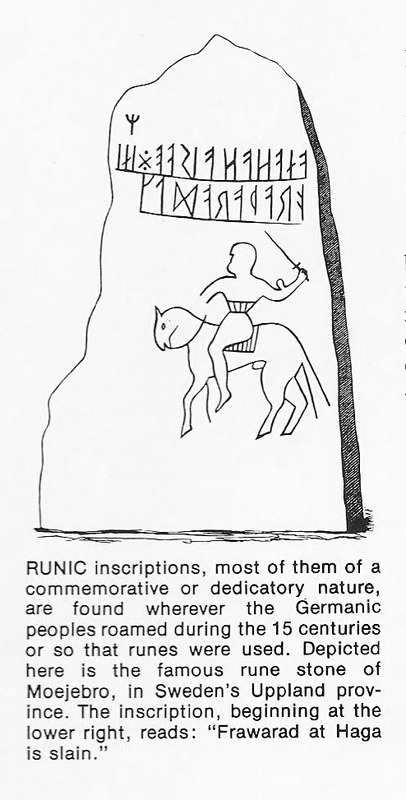 The more efficient Roman alphabet eventually supplanted the futhark for most purposes throughout northern Europe, but runes continued to be used in a few places — especially in Scandinavia — as late as the 17th century. The origin of runes and the futhark is as murky as the water in the depths of today’s polluted Rhine. The evidence is sparse, and scholars disagree in their interpretations of it. Each rune had a name related to the sound of the character: names like “hail,” “ice,” and “birch.” A single rune could stand for its name-word itself, as well as for the sound associated with that word. It was thought to have magical powers that could be used to evoke, or protect against, the force contained in that name. Runes were often inscribed on weapons, tools, and rings to give them talismanic powers. The 15th rune in the original Germanic futhark is the one with which we are especially concerned here. It appears variously with diagonal strokes pointing upward, downward, or in both directions. All these forms represented the same sound, originally “z.” Rune masters wrote individual runes up or down, left or right, without distinction. 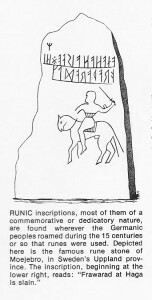 Nor was there any single convention for the direction in which lines of runes were written. 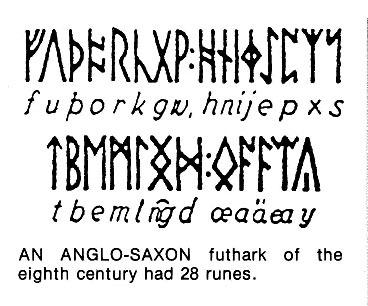 Later, in the reduced Norse futhark of the Viking Age, a formal dichotomy developed. 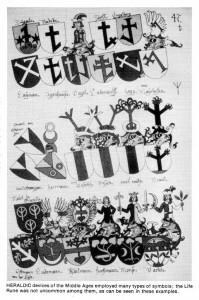 The arms-upward rune was known as the Man Rune and had an “m” sound. The arms-downward rune had the strong palatalized “r.” It was called the Yew Rune or “bow made of yew wood,” a symbol of death. Conversely, enemies of Christianity — Saracens, Satanists, and others — bent the arms of the Latin cross downward to signify the crucifix broken. 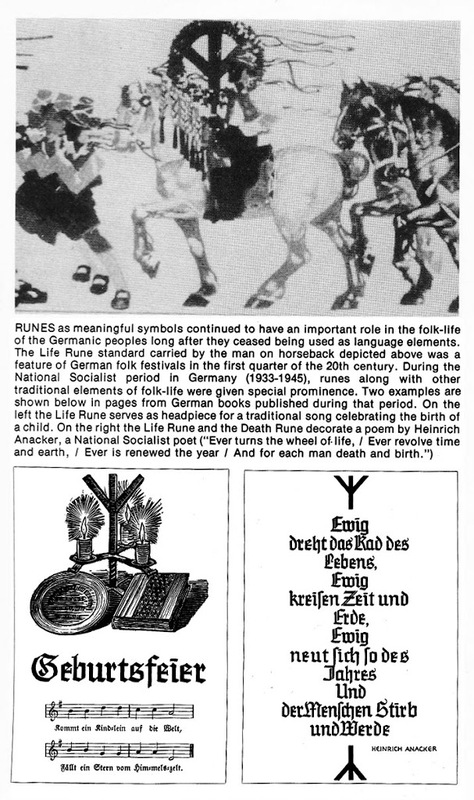 In Germany, Life and Death Runes were used in newspaper obituaries, death notices, and on gravestones: The Life Rune by the date of the person’s birth and the Death Rune by the date of his passing. 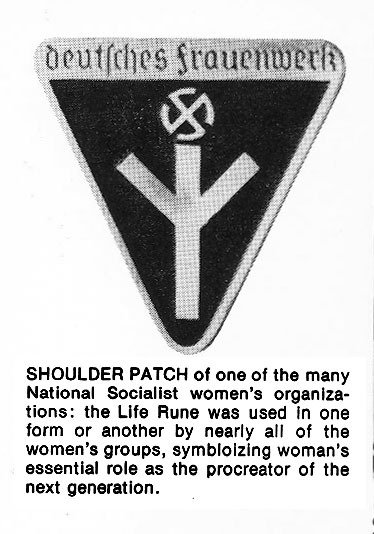 Runic emblems were also a prominent feature of National-Socialist military and civil service regalia. Among the runes used were the Tyr Rune (after the Norse god of war for whom Tuesday is named), the Sun Rune, and the Life Rune. The Life Rune was used to identify members of National-Socialist women’s associations, welfare workers, and medical personnel in a number of organizations. 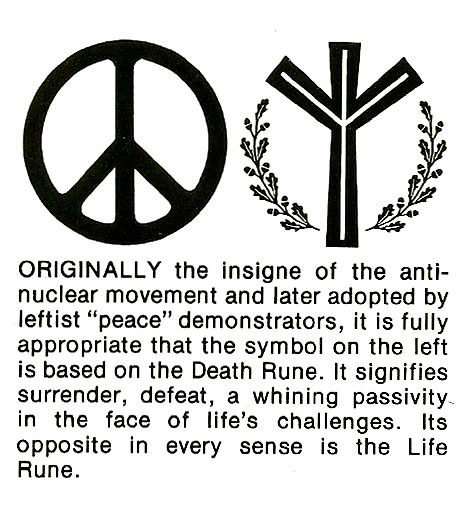 The designers of the emblem conceived for the nuclear disarmament movement in the late 1950’s — later known as the “peace” symbol — were aware of the Death Rune context. They described their design as a highly stylized human being with arms only slightly raised from a downward position in an attitude of hopelessness: a gesture-of-despair motif. They knew it was of ancient origin and signified the death of man. thank you for the very informative article .i did an image search on the peace symbol for a tattoo design when i looked at the peace symbol today , i saw the 3 parts of man, mind ,body and spirit become one, finding that higher “self” finding true peace and i thought thats what its original designers saw as well during its conception. it lead me to research it, which led me to your page. thanks once again for the knowledge. The peace symbol is based on two semaphore signals N and D standing for nuclear disarmament. End of discussion.